Where did Oreo get its name? OR-eo. o-RE-o. If we weren’t so used to reading it on bright blue cellophane-wrapped sleeves of cookies or seeing it plastered across cartons of ice cream, we would be mystified as to what the hell Oreo actually means. Food historians can’t pin the name down either. It’s unusual to find a food without a namesake. Take Chips Ahoy!, another Nabisco cookie. The name comes from a play on words of “Ships Ahoy!”. Even the name Nabisco has a history: it’s short for the National Baking Company, which brought together 114 bakeries in 1898 from across the country. There’s some strange comfort in knowing how a food earned its name. Alas, the Oreo remains a (delicious) mystery. One thing we do know, however? The Oreo is a knock-off. It seems like a common story: two reigning food companies come to a stand-off, where the winner is determined by only a handful of products. Nabisco entered into its final standoff with Sunshine Biscuits in 1912. It was a battle that was ten years in the making. Nabisco and Sunshine dueled over Animal Crackers in 1902. Nabisco, with Barnum’s Animals, was the winner. Barnum’s Animals were packaged in bright red, rectangular boxes, designed to look like the cages at P.T. Barnum’s actual circus. The box (which we still have today) had a string attached to it, making it ideal to hang on a Christmas tree. Then, Sunshine had a breakthrough. It was in 1908 that Sunshine Biscuits created the Hydrox. It was a cookie sandwich made with two crunchy, chocolate biscuits with a layer of cream smushed between them. Jacob Leander Loose and Joseph Scull Loose, the owners of Sunshine Biscuits, had invented a product that only used the best ingredients. They had finally beaten Nabisco. It took Nabisco four years to accept the chocolate cookie challenge. But, accept they did. In 1912, they successfully unveiled a competitor to the Hydrox. Enter, the Oreo. This cookie had a sweeter cream filling and two chocolate cookies that became wonderfully soggy when dipped in milk. (All-natural “oreos” today face the same problem as the Hydrox cookie did back then; they stay stubbornly crunchy post milk-dunking.) Nabisco, in a landslide, stole the show. Americans had to wait another sixty-two years for the next Oreo invention: the double stuf Oreo. The double-stuf, with twice the cream filling, was another win for Nabisco. (Double stufs win out over single stufs every time.) As the Oreo became more popular, Nabisco kept adding more flavors (and sizes) to the list. In 1987, they launched the Big Stuff Oreo, which claims to be several times the size of an original Oreo. Sadly (very sadly), they were discontinued in 1991. Two years later, Kraft Foods acquired the company. But what about the Hydrox? Sunshine Biscuits, after being sold to Keebler and then Kellogg, discontinued selling Hydrox in 2003. Avid fans, however, after petitioning to save Sunshine Biscuits, managed to get the cookie back on the shelves for its 100th birthday. Nabisco, like all food companies, had some misses with its flavors. Do you know they made a rainbow sherbert Oreo in 2013? 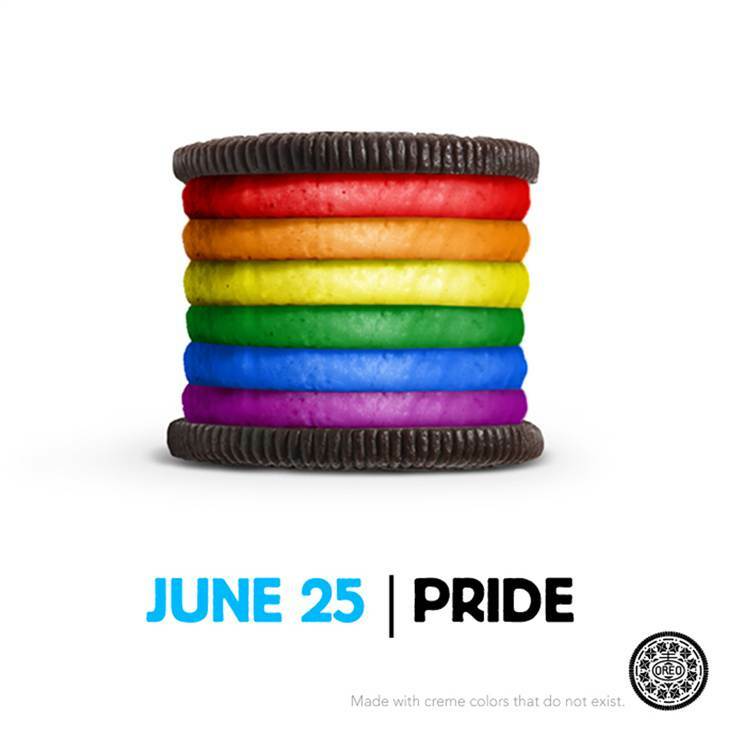 (It sounds just a little less awful knowing that they used vanilla cookies instead of chocolate– but…still… ew.) The newest flavors this year, Marshmallow Crispy and Chocolate Chip Cookie Dough, also had so-so reviews.